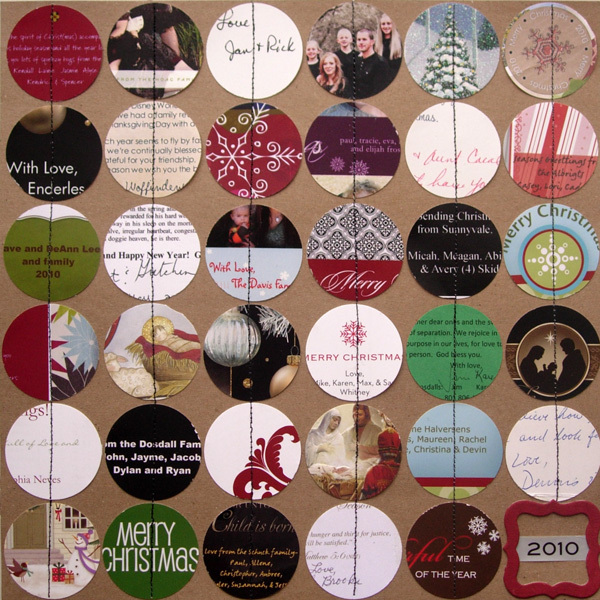 Welcome to my crafty Christmas countdown 2011! I did this last year (and a few years ago) and it's a lot of fun, so I thought I would do it again this year (if you'll forgive me for not making new graphics for this year then we're all good). Each day I'll feature a cool Christmas project and provide a link to the source so you can try it out for yourself if something inspires you. Today being December 1st I will link you up to the new gallery which just launched today at Write.Click.Scrapbook. where you can find (among many other fabulous submissions) this layout that I made. I have always struggled with what to do with Christmas cards from friends and family after the holidays. I hate clutter and I don't like bulky things taking up precious storage space so after several years of hanging on to all of them I finally got sick of them and just started throwing them away. Last year I decided that I really should have some kind of record of who our friends and loved ones are so I decided I could spare one scrapbook page dedicated to Christmas cards. I punched circles from each card trying to capture the signatures/names and some fun design elements, and then I sewed them in a grid pattern on a plain piece of kraft cardstock. I added a painted chipboard frame and a date sticker and voila! I think I'm going to do this every year. Labels: christmas countdown, scrapbook layouts, write.click.scrapbook. Fantastic idea Aly! Thanks for sharing.